nature. 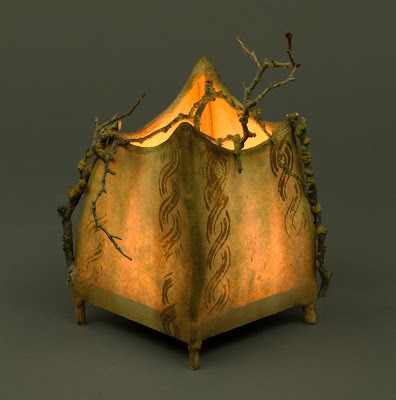 The lamps are called, "lamps with soul" and the name is perfect for these magical and enchanting creations. "Lilith", the lamp shown below is one of my favorites, and sadly for me, it has been sold. 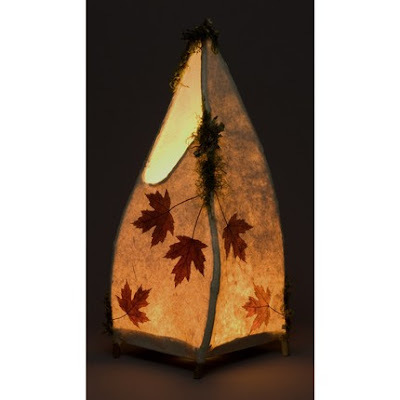 In each listing, the artist gives a description of how she creates the lamps, from raw fibre to finished product. 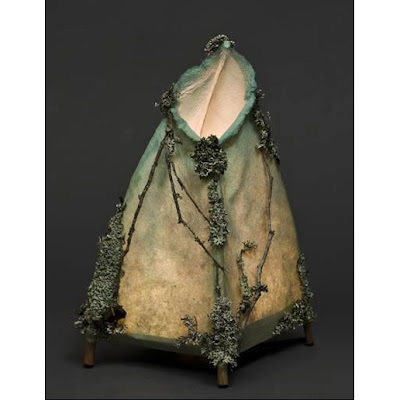 Part of the description for Lilith reads, This lamp is made of handmade hickory bark paper. I start with the raw fiber. After cooking in an alkaline solution, the pure fibers are beaten to make a slurry and then formed into sheets which are wrapped around the twig framework. As the paper dries it takes on it's own character.Lilith is embellished with a various lichens and twigs and has a soft aqua coloring. My title suggests that this very inventive and creative artist offers more in her shop - and she does! 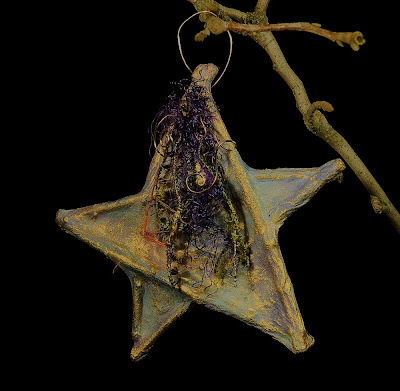 Delightful organic paper 'wyldestars' that would look fabulous hanging randomly in the yard, and even though there are no wall sculptures available at present, there have been in the past (a reason right there to bookmark this site and check back!). Sue... Holy Cow...these are beautiful... Thank you so much for posting and sharing! How are you doing...I miss you! Thanks for sharing my work, Sue!! 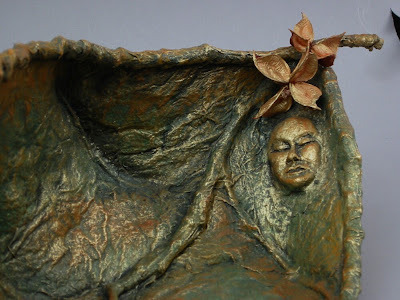 The artist you featured last week (mygrandmothershands) is a very good friend of mine! Small cyber world, huh? I've just started mine own blog, http://www.wyldewoodpapers.blogspot.com, so one of these days I'll be happy to return this honor. Just too beautiful. Some of the shapes remind me of the Moroccan lamps. There is an earthy appeal...will have to check them out! Oh my... these are sooo beautiful and "Lilith" is my favourite too :) WOW what an amazing artist!!!!!! WOW I'm am so so impressed. They are wonderful. And yes I do feel like they are soul lamps. When I was in Spain we were in a Moroccan neighborhood and they had lamps like these for sale... but your are fabulous! I am loving this also. I am going to check it out. Thanks for sharing! You are finding some real treasures as these are so gorgeous!!! I didn't get a chance to comment on the other post with My Grandmother's Hands but I am so loving her work also!!! I nearly passed out when I saw the Cabinet of Curiosities. That is beyond cool. I hope your camera is finished charging soon so I can see what you've been up to!! Thank you again for your generous spirit in honoring and sharing our work! It was such a pleasure to be featured! And this week you have chosen one of my BGFs Jan and her amazing work!!!!!!!!!!!! I can say for a fact that her lamps are even more gorgeous in person than they appear to be in pictures...as I am sitting next to my very own as I write this! about it! (LOL, I'm not really that much into "misery loves company"). Wishing you both lots and lots of sales! Sue...what a find! Her work is absolutely breathtaking. I am definitely going over to check her out. Hey Sue, Pop on over to my blog. You've got an award there waiting for you!